We partner with our clients and offer survey feedback gathered and analysed in real-time from key groups with a smart phone or IPAD. Our apps have the capability to run several parallel questionnaires for different stakeholder groups. The apps work by reporting and returning completed survey data via 3G or WiFi network connections as the survey/questionnaires are completed and compiled. Any data collected while a network is not available will be stored within the app and delivered once the smartphone or iPad device reconnects to a live network. 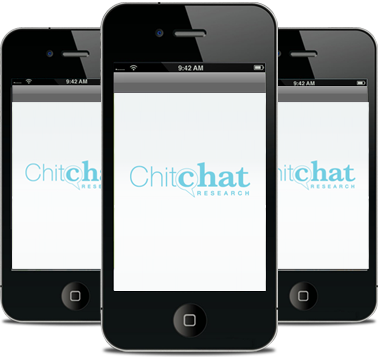 Designated staff are able to view the survey feedback in real-time by logging into their client account on the Chitchat Research website. Upon entry, they are presented with a custom built dashboard, displaying critical statistics chosen by the client. The format of this information is flexible, it can be displayed as raw data or charted, charted by store, charted by State etc. This data can also be extrapolated and uploaded into systems such as Q or SPSS. Further, the survey questions placed on these apps are able to be amended or changed when necessary and all former data archived for future referral. We often use this technology for clients who employ mystery shoppers. This specific app allows for pin dropping, survey feedback in real time and easy manipulation of the data across states, stores etc.